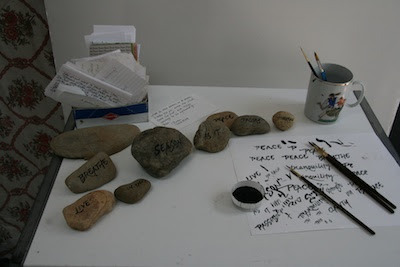 I've begun to play around with writing on rocks. Last year I did some plant ID rocks with a permanent marker. This year I decided to go for quotes and use a brush and acrylic paint since I have lots of Golden fluid acrylic left over from the Hawthorne Birthplace lettering project. For some reason I envisioned large broad brushes soaking up lots of paint. The reality was a half-inch brush and a very small amount of paint. I did find that being over-prepared in the materials department helped to assuage some of my pre-project anxieties. I washed the rocks, dried them in the sun, did the lettering (fluid acrylic mixed with flow extender and Escoda brushes from John Neal), and then sprayed them with Krylon Crystal Clear Acrylic. The finished rocks seem a little shiny to me but they may dull in the weather. When I get a chance I'm going to get some spray with a matte finish to try. I like the idea of bringing the work off of the wall and out of the house. 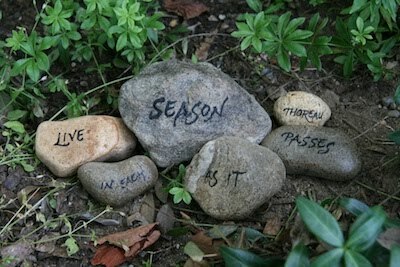 Here's the quote from Thoreau in the front garden. We'll see where it goes from here. Susan, this is such a beautiful bond with art and nature!